Populates controls in a UX component with data from a table. 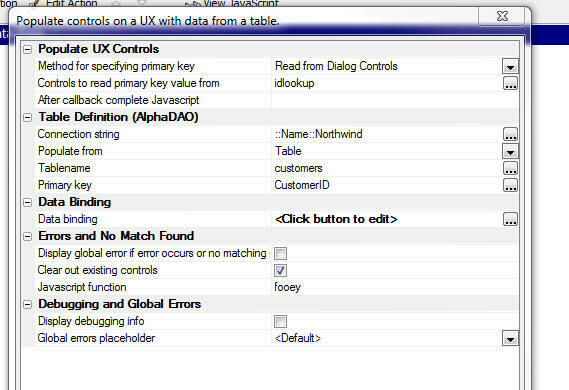 Use this action (rather than the 'Populate Controls in a UX Component with data from Tables' action) if the UX component has not been bound to a database (see the 'Data Binding' pane in the builder). Specify the primary key value of the record you want to use to populate the UX component controls. If the primary key has multiple columns, enter the key value with 3 pipe characters (|||) separating the value for each column. For example, if the primary key is Firstname and Lastname, you could enter John|||Smith. Specify if the controls are populated from a table or a query (that joins multiple tables) Choices include Table, Query. Specify how fields in the target table are mapped to controls in this Component. Display global error if error occurs or no matching record found property. Clear out existing controls property. Specify if the SQL statements (for SQL tables), or Xbasic code (for .dbf tables) should be shown. Note: If the 'After submit action' is set to redirect, then you will not see the debugging information (unless there is an error), because control will be redirected to the target page. Specify where debugging informatin should be shown. If you are working in an application that uses Panels, you will typically put a placeholder in the Panel to show debugging information in the appropriate panel. Set to <Default> for the default placement of debugging information. Specify where global errors (if a commit error that is not specific to a particular field) should be displayed. If you are working in an application that uses Panels, you will typically put a placeholder in the Panel to show Global errors in the appropriate panel. Set to <Default> for the default placement of global errors.